Support for the Palestinians often assumes that they are one undifferentiated people. But of course, even under occupation, there is a Palestinian bourgeoisie and middle-class, however small and weak politically, and a Palestinian working class and peasantry. It is the poorest Palestinians who suffer most from the Occupation and likewise it is the Palestinian rich who have shown their willingness to become pliant tools of Israel and the United States, as epitomised by Palestinian ‘Prime Minister’ Fayed, ex-World Bank and his security police torturers. It is important for a number of reasons that we should support to the utmost Palestinian workers. Firstly because of the justice of their case. Secondly because it attracts labour movement support internationally for the Palestinian cause. Thirdly because it shows that the attack on the Palestinians nationally finds its expression in class oppression and also because we have an interest in ensuring the maximum strength of the Palestinian working class who unlike Abbas and co. won’t sell out for 30 pieces of silve and finally because working class struggle is a direct means of appealing for support to the Israeli working class. It is noticeable that Histadrut, the Zionist’s racist trade union, has nothing to say about this dispute. The strike of Palestinian workers at Salit Quarries has completely frozen the firm's economic activity. Trucks from outside contractors which arrived in the first days of the strike to load up with sand and gravel no longer come. Traffic which on a regular working day constitutes some 100 trucks has stopped. Damage to the quarry so far is estimated at about NIS 2 million. 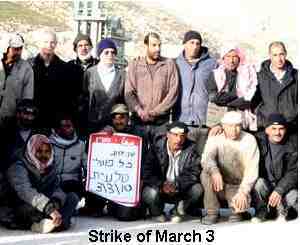 Some background details on the strike: At the beginning of April, after a year of negotiations, a collective agreement was drafted between the Workers Advice Center )WAC-MAAN) and Salit Quarries, which are located in Area C of the West Bank. The official signing was to be on May 2, 2011. However, the quarry management cancelled this meeting and adamantly refused to agree to an alternative date. After WAC declared a labor dispute on May 23, the management finally agreed to a final date for the signing of the agreement: June 16. In light of this proposal, WAC and the workers agreed to postpone the strike in the hope that an agreement could be signed. However, this meeting too was postponed and no reason given for the postponement. Wednesday: Singers and guitarists from the Jerusalem rock band Uruguay came and sang working songs in Hebrew and Arabic. In addition, British photographer and art teacher Judy Price came, and told the workers about an exhibition that had recently opened in the Palestinian Museum of Art. She also coordinated a visit of the Salit workers to the museum. 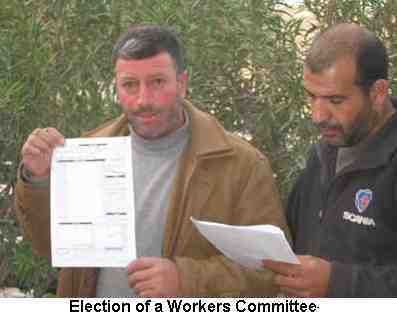 The previous week, a number of representatives of Palestinian unions had come to the tent set up by the workers. On Wednesday, Arafat Nakhleh, head of the PGFTU legal department, came to express solidarity. On Thursday, Attorney Castro Daoud came representing the center for workers rights in Ramallah, DWRC. The strike has also attracted wide media coverage, both electronic and printed, including articles in Ynet, Haaretz and Zman Yerushalayim , an interview with the workers' representatives and the union on the Voice of Israel radio station in Arabic, plus the Voice of Peace, Voice of Palestine and more. The workers' response to these overtures was decidedly negative. The workers are determined to strike as long as no collective agreement is signed. This continual postponement of the meeting is a direct continuation of 28 years of working in exploitative and humiliating conditions at Salit. The workers are united in the belief that unionization is vital and there is no going back. Their position is unequivocal: they won't go back to work without an agreement. Either they respect us and our choice of WAC as our union, and sign a collective agreement, or they close the premises. It must be noted that tens of thousands of Palestinian workers are currently employed in factories and firms under Israeli ownership in Area C – i.e. the area of the occupied West Bank under Israel's administrative and security control. The Salit workers have become a model and important precedent for these workers, all of whom are employed under harsh terms with no union protection. The struggle is also attracting attention among unions abroad. WAC has received copies of many protest letters sent by unions, including dozens of protest letters from different unions belonging to the ABVV-FGTB in Belgium, from the International department of the CCOO and USO in Spain, from the 3F in Denmark, from the FNV in the Netherlands, and from the UE in the USA. We aim to collect 10,000 euros for a strike fund. So far we have received 8000 DKR from the 3F and AIF in Silkeborg, $1,000 from the Palestinian Network in Denmark and $750 from Norway. We still have a long way to go to reach our goal! We thank you all for your show of solidarity with the struggle. Together we will win!